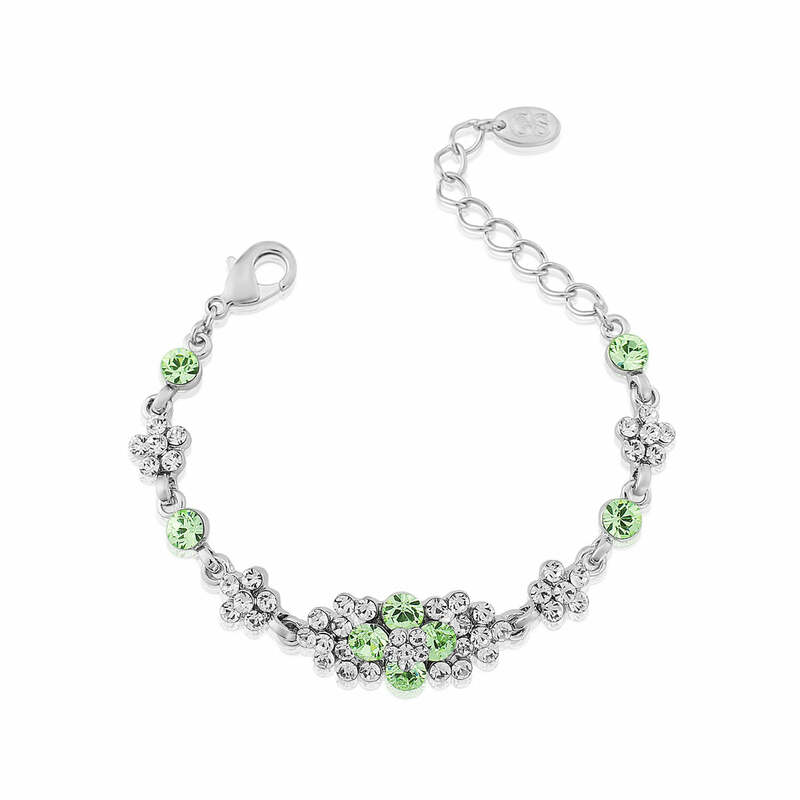 Pretty green crystal floral bracelet inspired by the retro charm of the 1950s. A beautiful hue for a green wedding theme. For us, mint green is a fresh, light and fancy free hue and we have captured this in our stunning Peppermint Dream Bracelet. Featuring a bejewelled centre piece with a silver tone chain adorned with petite glittering clear crystal flowers and mint green single studs, it is truly beautiful. A fabulous bracelet which comes alive with its delicate green sparkle, this is the perfect accessory to add glitz to a 1950s full skirt or a pretty floral tea-length dress. Charming worn alone or retro glam teamed with our matching Peppermint Dream collection this beautiful design is captivating and elegant. For brides looking for a touch of vintage glamour with a pop of colour Peppermint Dream is a must have. The perfect accessories for a mint green wedding theme for both a bride and her maids, team with pretty white posies tied with mint striped ribbon or contrast with pretty pink florals for a summer pretty wedding style.